Please make your homepage "USAPentathlon.org" or visit it once a day. The US Olympic Committee awards organizations for the number of hits it receives. Tell your facebook and twitter friends to help us achieve the next level. Funds received will trickle down to the local level. Thank You. Feel free to browse our site. Since 2002 we have been providing training and instruction in the Olympic Sports of Fencing and Modern Pentathlon. Please contact us if you need any additional information. All Texas Athletic Center, inc. The All Texas Athletic Center Fencing Club is operated by the All Texas Athletic Center, Inc. The All Texas Athletic Center, founded in July 2002, is organized as a nonprofit 501(c)(3) organization operated by a Board of Directors with a special interest in developing amateur athletics in the greater Austin/San Marcos/San Antonio area. Our Newest Program has been a huge success! At the 2012 NORCECA Championships in Colorado Springs all our club members medalled. When and Where Do We Fence? All Texas Athletic Center Inc.
We respect your right to privacy. All information submitted by you remains confidential. Privacy is a topic of concern for any Web surfer these days. We created this policy in order to demonstrate our firm commitment to privacy. The following discloses our information gathering and dissemination practices. We will not sell your e-mail address or other personal information to an outside, un-affiliated organization or any unauthorized third parties. ATAC Fencing Club founded in 2002 was the first club sponsored by the All Texas Athletic Center, inc.
All Texas Athletic Center Fencing Club is committed to providing diverse programs to bring fencing to beginners, experienced, youth and adults alike. ATAC achieves this objective by offering a mixed program of youth and adult development classes, private lessons, open fencing and special camps throughout the year. Our schedules are set on a school semester basis due to our use of TxSt facilities. We are usually able to use the facilities during school holidays, but sometimes the fencing gym is occupied with special camps. Please check our web site for special schedules during school holiday periods. The Youth Program is for ages 8 to 20 Thursdays 7-8 PM at the Jowers Center gym 221. Attendance at all sessions is not required, but available. We encourage our youth fencers to have other interests besides fencing. Classes are on going and students can start at any time Fee: Spring 2014 $150 (Jan 14 to May 15) ($25 membership fee payable to ATAC, Inc. and $125 instruction fee payable to instructor) Monthly payment plans are available. Family Membership regular fee for 1st student, $50 discount for subsequent students. Maximum $400. USFA membership required for insurance purposes. 705 per year. First time members can join as non-competitive members for $5 and upgrade to competitive members at any time during the year. *Online USFA membership registration now available. Go to USFencing.org and pull down on membership tab. The Learn to Fence Program is a series of 4 classes to introduce new students to the sport of fencing and to see if the student desires to continue. All equipment is provided and the cost for the 4 classes is $50. Classes are ongoing and can be joined at any time. Minimum age requirement of 13 (USFA requirements for eligibility to fence in open competition) Mondays and Wednesdays 7:00 - 9:45 PM at the Jowers Center No group instruction provided. Fencers may arrange private lessons with instructor of their choice during this time. Fee: $200(Fall) Fencers must provide own equipment. For those students with competitive fencing experience Strict code of conduct will be enforced. Permission of instructor required. Open Family Memberships Fee: 1st member at regular price, 2nd member $50 discount, maximum family fee $400. In 2014 the Summer Learn to Fence Camps have been canceled! Information about Fall classes coming soon! Fencing is a sport and it is supposed to be fun. We recommend that the young fencer establish his/her own fencing goals. The amount of effort from your child is up to her/him. The staff and Board of Directors at ATAC try to support children in their attempts to achieve rather than to be victorious over someone else. Athletic achievement can have a significantly positive impact on the growth of the young fencer as she/he learns analogously from handling the obstacles presented in sport. The instructional staff and management at ATAC are constantly attempting to mold a program that realistically stimulates and challenges your children. We ask that the parents refrain from "pushing" so that the fencing does not take on the overtones of "homework." How a Parent Can Help Young Fencers Besides following the recommendations above, we feel it is important for the parent to educate themselves about the sport of fencing. "Fencing is a skill sport. It requires a special kind of athlete who can satisfy the physical and psychological challenges of head to head combat. "Fencing is one of the few sports where boys and girls compete against each other on equal terms, no special concessions granted. "Fencing demands self-discipline. Win or lose, the fencer alone is ultimately responsible. "Fencers forge friendships with their opponents off the strip. After all, they frequently train together. "Fencers learn to accept authority. Referees (directors) are always "correct," even when a "bad call" eliminates an athlete from a tournament. At the same time, fencers learn to respectfully question authority. "Fencers acting as referees (directors) learn to make decisions with confidence. They learn to explain their decisions intelligently and control the action on and off the strip, all the while under the critical eye of their peers and an audience. "Fencers learn to share. They share equipment and knowledge. A winning fencer will often share what went wrong with the losing fencer's game. More experienced fencers will share previous successful strategies against specific fencers, even though this knowledge may lessen their chances for victory. "Fencers develop the ability to establish long-term goals. In fencing, an athlete doesn't have to win to be successful. Many young fencers know they don't have the knowledge or the experience to beat a particular opponent or win a tournament; but they learn to set personal goals for themselves, one touch against each opponent for example. "Fencers can, and do, learn to be winners before they ever get a medal at a tournament." ATAC has a zero tolerance policy regarding the abuse of drugs and alcohol. The abuse of such items, either at the club or on ATAC trips will not be tolerated. ATAC welcomes students of any race, religion, national or ethnic origin, sexual orientation or physical disability. The Board of Directors shall not tolerate any discriminatory act or act of harassment, sexual or otherwise, from staff members, other fencers, or observers. If you are uncomfortable at anytime, for any reason, please notify a member of the Board of Directors immediately for a private consultation. We want your fencing experience to be rewarding and positive. The staff and instructors of the ATAC Fencing Club believe that anyone who has the desire to learn should have the opportunity to fence. Even those with health problems or physical limitation have the opportunity to learn fencing. Our coaching staff will assist you in developing a program around any limitation you may have. We want everyone to be happy and feel comfortable at the ATAC Fencing Club. If there is a problem of any kind, please let a Board Member know. We attempt to guide students to the instructor most suited to their weapon, fencing style and personality; however, should your child want to switch to a different instructor, this is not a problem. No discrimination, no harassment is tolerated by any member of the ATAC family. Safety is everyone's responsibility. Although fencing is a combat sport, observance of some simple rules will prevent most injuries. Wear proper attire. Proper fencing attire is comprised of mask, glove, white jacket and knickers, and lame. The proper attire is important for classes and lessons as well competition. Knickers do not have to be worn for classes or lessons; warm-ups or sweats are adequate. It is advised that shorts not be worn for classes and lessons as they leave legs unprotected. Fencers may wear shorts while exercising or warming up, but should change into adorn warm-ups, sweats or knickers once classes and lessons commence. Never enter the strip area without your mask. Always wear your mask when bouting or taking lessons. Always wear your protective equipment (underarm protector, proper clothing, breast protector, etc.) Examine your weapons and protective equipment prior to bouting. Make sure your strip surface is clear of all debris, weapons, masks or other items which may cause trips, slips or falls. No horseplay on strip and never attempt to make contact with someone who is bouting on another strip. Never enter or exit the fencing area by crossing a strip where bouting is occurring. Always use the walkway, but be aware that fencers may come across this area at any time. Come physically prepared to fence. Fencing requires vast amounts of energy and uses tremendous stores of body fluids and nutrients. If you have been ill, or are not feeling well, don't fence. Warm up before bouting or lessons. Practice good fencing techniques, posture and footwork to prevent bad habits which lead to injuries. Bout only when a coach or instructor is present, and only under qualified supervision. It is a requirement for insurance purposes that all ATAC fencing club members participating in open fencing sessions be members of the United States Fencing Association. 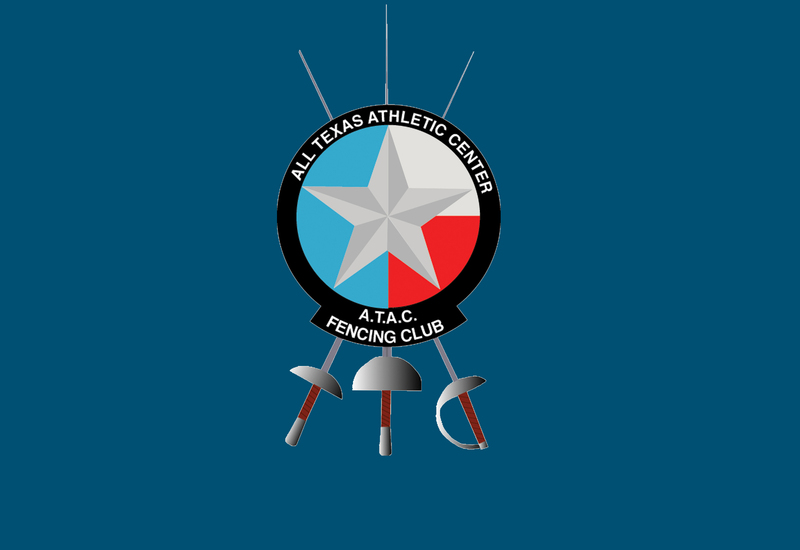 Fencers who wish to compete for ATAC in local, regional and/or national tournaments must have membership in the All Texas Athletic Center(ATAC) Fencing Club. ALL fencers who participate in classes and lessons at ATAC must complete and sign a waiver prior to their participation. Waivers are in effect for the entire fencing season, August through July. ATAC Coach's Policy is to send a coach to a tournament if 5 or more fencers request coaching for that tournament. The 5 or more fencers will be asked to pay coaches fees which cover travel, lodging, and per diem for the coach. Coach's fees can go from $10 to as much as $500 depending on where, how long, and how many ATAC fencers are sharing the fees. Usually at least one of our coaches will remain at ATAC; however, for large team events where a number of young fencers are competing, it may be necessary to send two coaches. It is the fencer's responsibility to notify the ATAC Fencing Club secretary (by completing an "Intent to Compete" form) that they want a coach at a tournament. The deadlines for notification and payment of coach's fees are: NAC-30 days in advance (so we can get the lower airfare and reduce YOUR costs) Local-2 weeks in advance When competing is a local, sectional or national competition it is important to remember the tournament is not over until a victor is established. An ATAC fencer who has lost his/her bout is not necessarily free to leave the venue. If other ATAC fencers are still competing, fencers need to remain at the venue to cheer on and support their teammates. At ATAC, fencing is a team competition. An individual fencer's victory reflects on the entire club. Individual Lessons are available from our coaches for an additional cost. Please contact them to arrange schedules and payment.